There were many more beauties—and bold looks—in the mix at the 2018 NAACP Image Awards on Monday (January 15) in Pasadena, California. Logan Browning: The actress channeled her softer side in a Maria Lucia Hohan ballet-pink gown with lace accents. I like the feminine, romantic quality of the design, but also the modern edge she brought to it with metallic accents including the belt and spherical clutch. Marsai Martin: High-low gowns are nothing new, but this Pantora Mini design was rendered in such a vibrant shade of emerald green that it made a statement with the fun and frills appropriate for the young ‘Black-ish’ starlet. Bianca Lawson: The lace and ruffles were boho-chic, but the sizzling, red colour was all-out glamour in this Needle & Thread ‘Marie’ tiered embellished tulle gown. Tamera Mowry-Housley: This Michael Costello one-shoulder gown was elegance personified—and a perfect example of how minimal sheer elements can be effective without going overboard. If I were to nitpick, the clutch seemed a big large. Jazmyn Simon: My guess is that we are all just appreciating the fact that this Thai Nguyen Atelier Pre-Fall 2017 sheer embellished gown was seemingly worn with undergarments. Ileana Makri jewels completed the look. Yvonne Orji: I was getting far more energy from Yvonne’s smile than her Patricia Bonaldi floral-embroidered, pastel gown that underplayed her vibrancy. Paul Andrew shoes and a Jeffrey Levinson clutch rounded out the look. Tiffany Boone: With a gown as bold as this Phuong My design, it’s hard to forget. So, you’ll likely recall Julia Michaels donning it at the 2017 American Music Awards. Here, it felt a bit too contrived for the event. Noudar ruby hoop earrings and a Le Vian diamond snake ring completed the look. Danielle Brooks: This Michael Costello tulle gown provided such a pretty princess moment for the star, but with sheer fatigue setting in, it would have been beautiful had it been lined. Samira Wiley: I love the intense, marigold-yellow hue of this Romona Keveža Spring 2017 gown. But, something about the silhouette fell a bit flat—perhaps because the hem ventured too long. IVY New York tourmaline earrings, a Le Vian tourmaline ring, and Mattia Cielo diamond bracelet added sparkle. 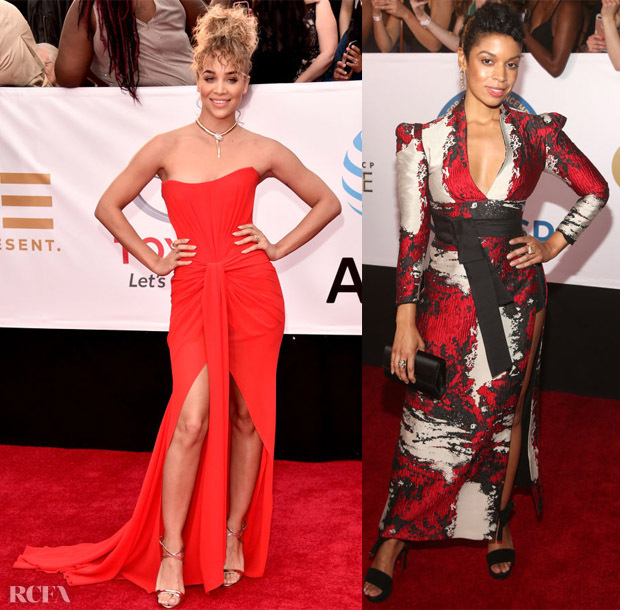 Jasmine Sanders: Another star in red, Jasmine relied on the lovely draping of this Ester Abner Resort 2018 corset gown to make a sultry statement on the red carpet. Metallic Giuseppe Zanotti ‘Dionne’ sandals reflected her jewelry. I think she could have modernized the look by removing the necklace. Susan Kelechi Watson: This Phuong My patterned look wasn’t as covered-up as you may have first thought. The obi-style, bold-shoulder tunic revealed a slit-to-there detail at the side. She styled the look with a Loriblu clutch along with Maxior diamond earrings and 18k gold rings. But, I think the length of the dress made the entire effect a bit awkward. Jurnee Smollett-Bell: I wasn’t a huge fan of this Costarellos Resort 2018 lacy gown, as it resonated a bit bland in colour and design. But, her half-up, half-down hair further detracted from the look. Her Sophia Webster heels wouldn’t be easily glimpsed from underneath the layers of lace. 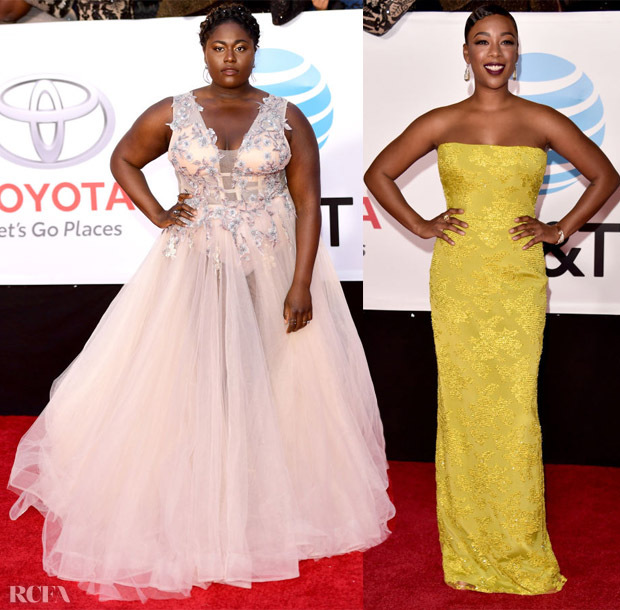 Naturi Naughton: Sheer from the side bodice, this ruffled look offered an additional note of quiet seduction to go with its streamlined, hourglass silhouette.